Packers RB Eddie Lacy had to wait until the second half to get into Sunday’s Pro Bowl in Hawaii, but he didn’t waste any time being productive once his number was called. Lacy blasted his way for 8 yards on his first carry in the third quarter and had 17 yards on his first four rushes before a pair of negative-yardage carries hurt his numbers. He finished with seven carries for 14 yards, plus one reception for 9 yards that helped set up a TD for Team Sanders. Lacy was the third of Team Sanders’ running backs to see action, following Kansas City’s Jamaal Charles and Washington’s Alfred Morris. Team Sanders lost to Team Rice, 22-21, on a late TD and 2-point conversion. 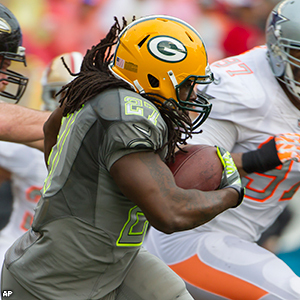 Prior to Sunday’s game, Lacy chatted with packers.com about his weeklong experience in Hawaii. Click here to read that.